The biggest news of the month is that ‘Rafiki’, Wanuri Kahiu’s latest feature film has just been invited to premiere at this year’s 71st Cannes Film Festival which is coming this next month. It’s exciting news for many reasons but primarily because Rafiki is the first Kenyan feature film to receive such an invitation from the biggest and most prestigious film festival in the world. But Wanuri is also no stranger to award winning since she won the Independent Movie Award at the Sundance Film Festival in 2010 for her post-apocalyptic eco-sci-fi film, Pumzi. That was a huge achievement in itself. But then, Wanuri is not a woman content to rest on her laurels! She began work on ‘Rafiki’ shortly after she won at Sundance. “I knew I wanted to make an African love story,” Wanuri told BD Weekender. ‘And I thought the love story between Kena and Ziki was a story I wanted to tell. It’s touching, sweet and honest,” adds one of Kenya’s most prominent screenwriters, director, and producer. Wanuri’s written the screenplay for ‘Rafiki’. But unlike the four other films that she’s made since she completed a Masters degree in film from UCLA (University of California at Los Angeles), she didn’t write the award-winning story on which ‘Rafiki’ is based. That accolade goes to another award-winning East African woman writer, Monica Arac de Nyeko. The Uganda author won the Caine Prize for African Writing in 2007 for her short story, ‘Jambula Tree’. The story, about best friends who fall in love, had struck Wanuri for its honesty and sweetness. And as she had been looking to base her next film on a love story, she felt it was “touching and sweet” enough to inspire a full length feature. The fact that Kena and Ziki are both girls didn’t bother Wanuri even though she knew she was creating a work that is about a ‘taboo-ed’ topic in much of Africa, lesbianism. “It took us five years to make,” says Wanuri, who struggled, with the same issue that most Kenyan filmmakers have, and that is funding. Ultimately, her film company, ‘Afrobubblegum’ got support from sources in France, Germany, the Netherlands, Norway and even Lebanon. But it was a challenge. The film stars two young Kenyan women actors Sheila Muruiva and Samantha Mugtsia, and it was filmed right here in Nairobi. 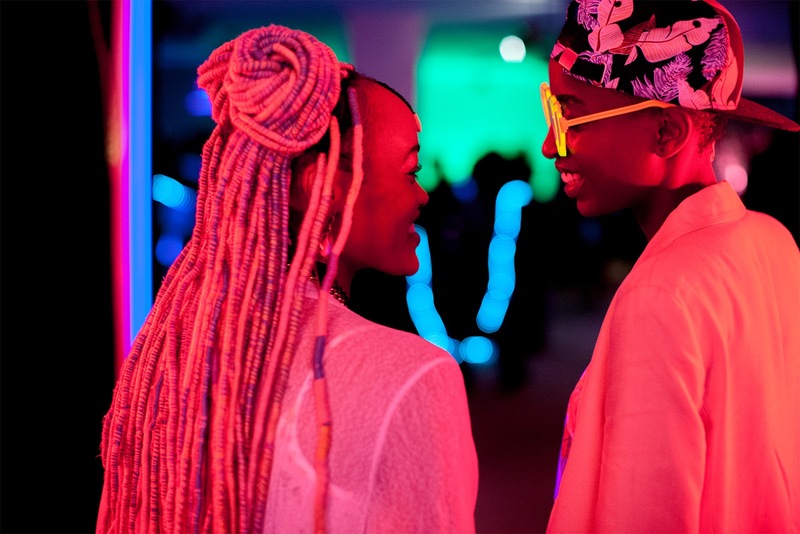 In a sense, the fact that ‘Rafiki’ will be first shown in public in France rather than Kenya is probably a blessing in disguise for Wanuri since her international audience will undoubtedly have a more open-minded perspective on the subject of women loving women than the average Kenyan. But Wanuri is clearly not disturbed by the blow-back she could receive from locals who don’t understand or accept the concept of lesbianism. An international audience is bound to appreciate other aspects of the film than the taboo. Plus what we have already seen from a film like Pumzi is that Wanuri grapples with larger social concerns than those seen in petty foreign soaps which still flood Kenyan airwaves. It’s no surprise that the second film Wanuri made was a documentary film for MNET on the life and vision of the great environmentalist Professor Wangari Maathai. Her following film, “From a Whisper’ is still vividly etched in my mind because she interpreted what human elements might have contributed to the disastrous bombing of the American Embassy in 1998. So we eagerly await the opportunity to see ‘Rafiki’ ourselves and hope the voices for free speech triumph over conservative forces bent on curtailing media freedom.